I was in Japan in February. I caught the Shinkansen, various branch lines and a few subways. It was so incredibly functional that I would have stopped and drooled all over the station floors, had there been time between our perfectly synchronised connections. But I want to share one tiny anecdote that happened far from the centre of Tokyo, on a tiny little single -track branch line that gets as many as 8 services a day. I was trying to go three stations down the line. I showed up about a minute before the service was scheduled to depart and rushed through a throng of people at the station to buy two tickets from the man. It cost about 700 yen, or $8, total. As I finished my transaction, the train rolled in. We made to go on the platform, but a uniformed man blocked our way. I showed him the tickets. “What?” I waved the tickets. “Taxi” said the uniformed man. “Taxi.” he repeated. I nearly flipped. “No way.” I was extremely skeptical, but the man was adamant about blocking the way onto the platform, and we had to get going. We wandered out of the station, and a taxi was waiting. We presented the driver our train tickets that showed our intended destination, and he nodded. We crowded in, with two other people who had been milling around in the station. He drove up the Valley on the road that runs alongside the train line. The meter went up and up as we drove through the snow and fog. It went over 2000 yen and we were getting nervous. Then, when we were nearly at the station, and the display showed 4600 yen, the driver just turned the meter off. We asked him to take us on to where we going and he immediately restarted the meter for the much shorter journey from the station to our destination. The bill for the 4600 yen went to JR.
To this day, I cannot believe how good that service is. They must have known they were up for the taxi fare when they sold us the tickets. But instead of saying, “Sorry, no trains!” they found and funded a much more expensive alternative. That is a service guarantee the likes of which I have never seen anywhere. 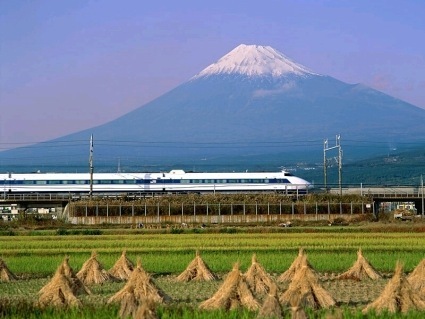 I love Japan Rail! I love em too. My favourite way to arrive in a foreign country I’ve never visited before: A quick shower at the deluxe Narita Airport, then buy a can of coffee and a can of Pocari Sweat from the vending machine, jump on a train to Tokyo, sit at your own personal table on the train and watch the rice fields go bye while drinking the weirdest canned beverages. Easiest and best arrival ever. And wikipediaing Pocari Sweat made me come across another thing….”The name Calpis was actually constructed as a portmanteau, by combining cal from calcium and pis from Sanskrit sarpis (supreme taste). Sarpis is used to describe the essence of Buddhist teachings.” Lucky they were going for an audience who doesn’t automatically translate sounds into English, and think of homonyms. Worst brand name ever, and further, lucky they’ve had 90 years to establish themselves. Previous Previous post: Does this man hate cyclists? The inaugural Thomasthethinkengine interview.